Asparagus, like brussels sprouts, is one of those vegetables I find is pretty polarizing. And, like brussels sprouts, asparagus is dreadful when it’s overcooked and limp. I feel almost embarrassed sharing this as a recipe. It’s just a simple method. But it sure is delicious. I use this for asparagus, broccoli, or green beans. When it’s roasted like this, it brings out the best of the flavor, and the texture is perfect. Tender, but not limp. Delicious as a side dish, stirred into a pasta dish, added to a frittata or, served with prosciutto and soft-cooked eggs for brunch. It’s incredibly adaptable. Sometimes, I serve it with lemon wedges for a spritz of fresh lemon juice. Other times, I drizzle in a bit of balsamic vinegar with the olive oil. Or, you can add a bit of fresh parmesan. See? Adaptations aplenty. Trim asparagus by holding the tip and bottom and bending the asparagus until it snaps. 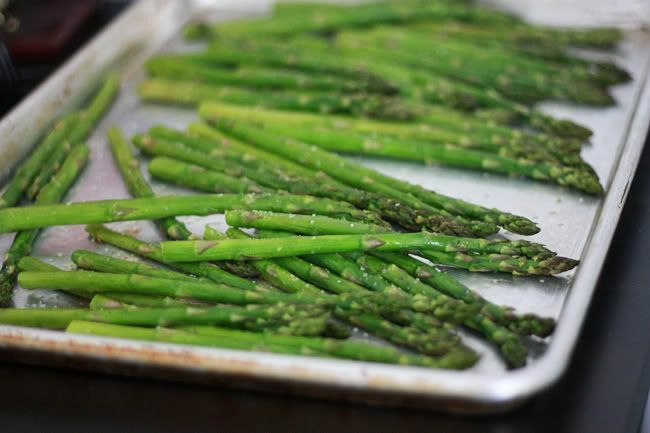 Discard woody ends and place trimmed asparagus on a baking sheet. Drizzle with a little olive oil, and sprinkle with a bit of salt and pepper. If using, sprinkle parmesan, or drizzle with balsamic vinegar. 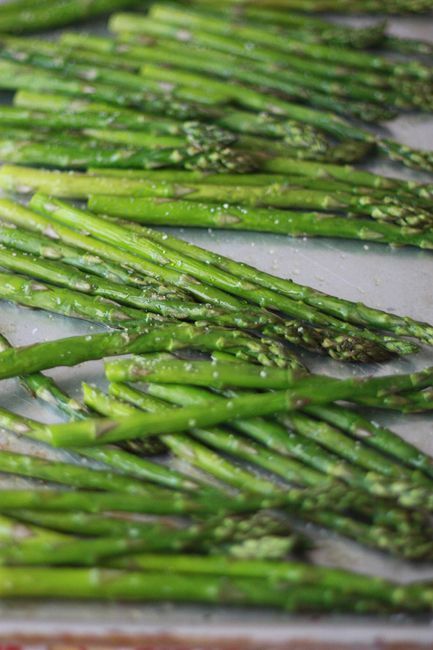 Roast asparagus at 375 degrees for 10-15 minutes or until tender and bright green. Oh, I’ve never tried cooking asparagus like this. I always steam it. Next time I buy it, I’ll roast it! One of my favorite vegetables when it’s done RIGHT! This is perfect- I have a bundle in my fridge I have to use before vacation next week. Thanks for the tips! I love asparagus! We are having it tonight, actually. I am excited to try this method. Thank you for sharing this! Chad and I LOVE asparagus when we go out to eat but the couple of attempts we’ve made at home have turned out….badly. I’ll be giving this a try this week for sure! I actually especially LOVE asparagus when it is cooked until the ‘limp’ stage. But, I’m willing to broaden my horizons. Thanks for the tutorial! 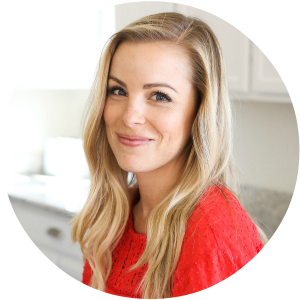 This is my favorite way to cook asparagus! Sometimes, I like to mince a few garlic cloves and sprinkle them on top before I roast the asparagus; delicious! 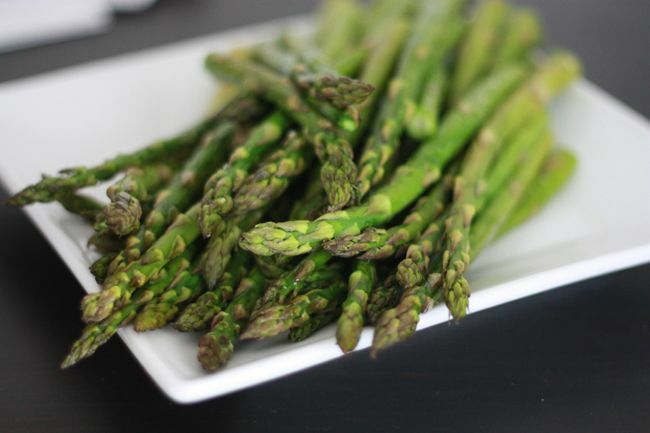 We LOVE roasted asparagus! There is something so nice too, about the crunch a coarse salt adds to it! Our favorite method includes drizzling it in bacon drippings (ok fine, bacon GREASE) so the kosher salt really sticks to it, then roasting it. YUM! Is it summer yet?! We have to wait 2 more summers before we can harvest from our asparagus patch, that’s like TORTURE! My husband claimed to HATE asparagus until I oven roasted it for him. Now he LOVES it and begs me to buy it for the veggie for dinners. 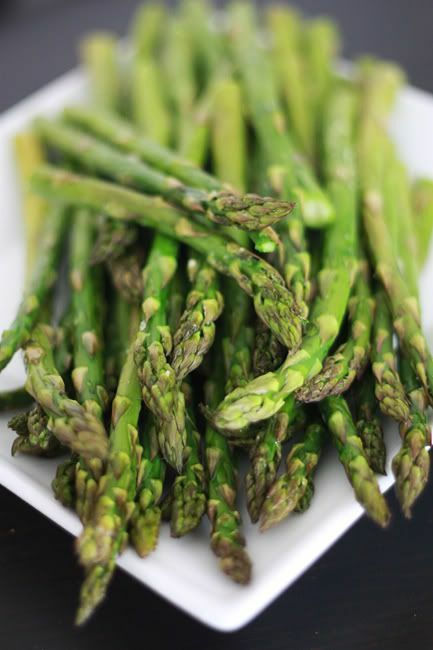 I love roasted asparagus, especially with garlic, lemon, sea salt, and parm, with just a little caramelization at the edges. This is how I do mine as well and we all love it around here! I love roasted veggies. You can add sliced shallots, grape tomatoes and a little bit of thyme with the asparagus and it’s very delicious! Yum! That sounds fantastic! I love roasted tomatoes.